I am always in constant search for new ways to do pork chops. 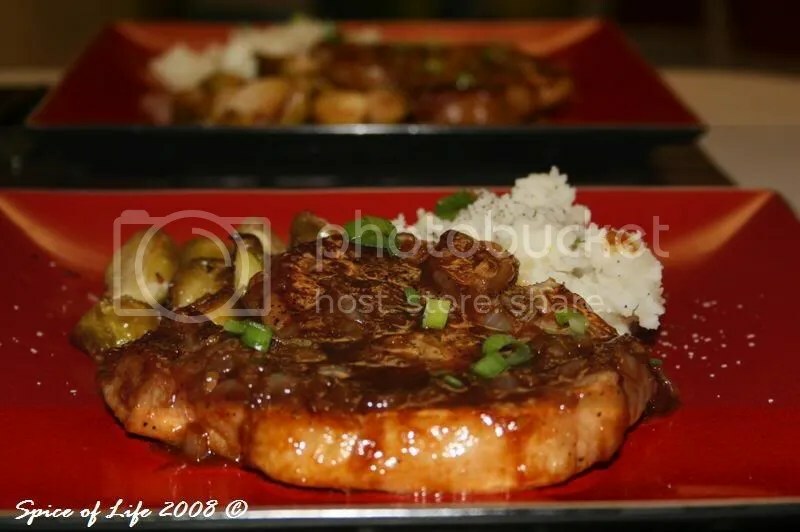 I am sure there is a thousand other ways to do it, but it seems to me that I am stuck with my 2 other reliable recipes in doing it – breaded or adobo-style (Filipino-adobo). And so here’s a new recipe inspired by Cooking Light magazine. 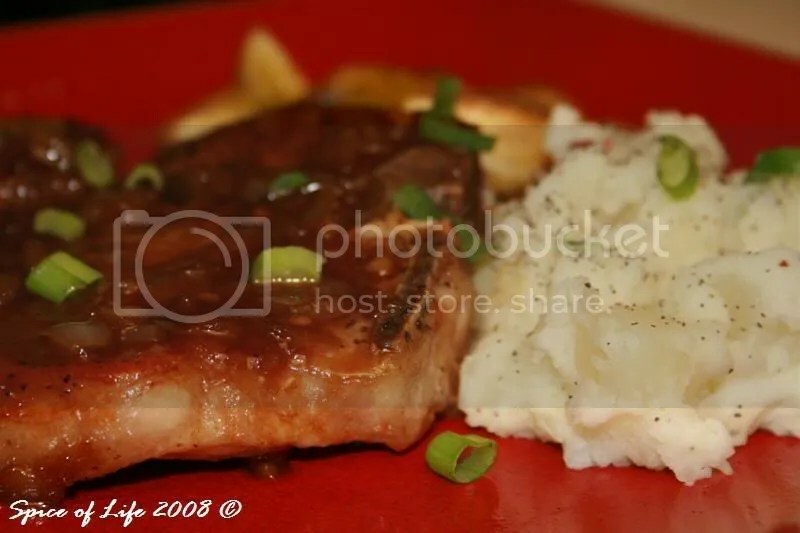 Apart from it being pork chop, the other thing that attracted me to this dish is its glaze. Adding fruit preserves to a savory dish is a new thing for me, and I’ve been trying this only recently. It’s a whole new world for me that I have yet to discover. 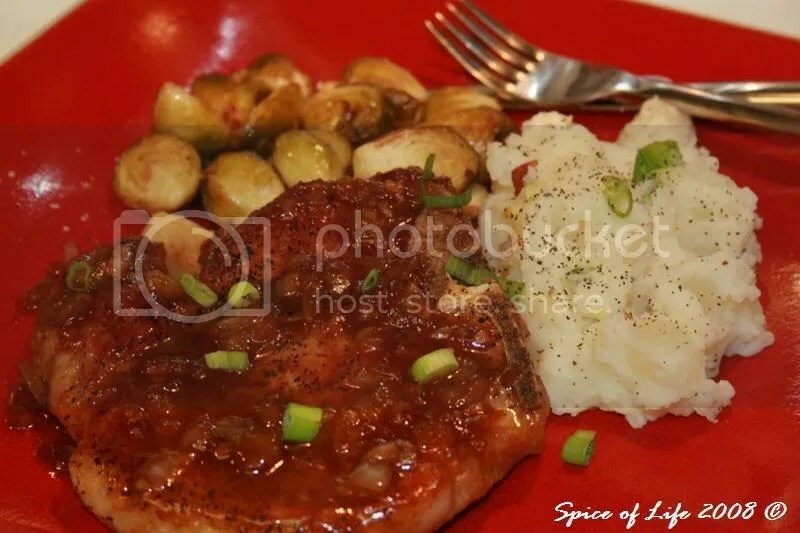 And so, here’s an Apricot Glazed Pork Chop. I would say that the apricots can easily be subsituted with other fruit preserves such as peach preserves or orange marmalade. For this dinner, I served the dish with Roasted Brussel Sprouts and Mashed Potatoes. 1. Heat a large skillet over medium high heat. Coat pan with cooking spray. Sprinkle a dash of salt and pepper to chops. 2. Add pork to pan; cook 6 minutes on each side or until done. Remove from pan and keep warm. 3. Add onions to pan; saute’ 4 minutes or until lightly browned. Stir in preserves, soy sauce, garlic and salt. 4. Cook 3 minutes or until thickened. Add pork back to pan, turning to coat. 5. Serve. Garnish with green onions. 2. Wash and peel off any damaged leaves from the sprouts. Trim the root end and cut in half. 3. Cook bacon in an oven-proof skillet over medium heat until bacon begins to get crisp, about 4 mins. 4. Transfer bacon to a bowl and set aside. (Take out some of the bacon grease if you think it’s too much.) Add sprouts to the skillet, season with salt and pepper. 5. Transfer skillet to the oven and roast for about 30-45 minutes, or until the sprouts are cooked through and golden. 6. Crumble bacon over the sprouts and serve. NOTE: I did not include a recipe of the mashed potato as I’m sure you have your way of doing it. You can do it however you like yours done.